In a development that could have been very useful over six hundred years ago, scientists have discovered a simple and effective way of determining if someone has Yersinia pestis, the bacterium that is responsible for the Black Death. A team based out of the Max Planck Institute in Germany were able to create a sugar-protein that serves as biomarker when tested on the blood of individuals who carry the plague. While the plague is not ravaging society as it once did, there have been sporadic outbreaks, including in India, China, Libya and New Mexico in recent years. The scientists also believe the process they used to develop this test will be useful with detecting other kinds of diseases. 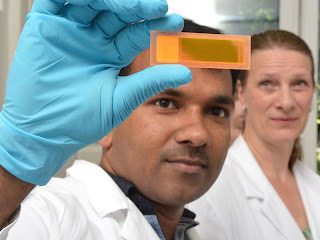 Click here to read the full details from the Max Planck Institute. The Smithsonian Institute blog Past Imperfect has a very interesting article on Islam’s Medieval Underworld. It focuses on the Banu Sasan, a loosely organized criminal network that operated throughout many Muslim lands during the Middle Ages. They were thieves, burglars, murderers and con artists, and their activities often got mentioned in Arabic literature. Archaeologists working in the imperial forum area of the city of Rome have uncovered the remains of an 8th-century workshop and a residential area dating to the 14th century. You can read more from ANSA. 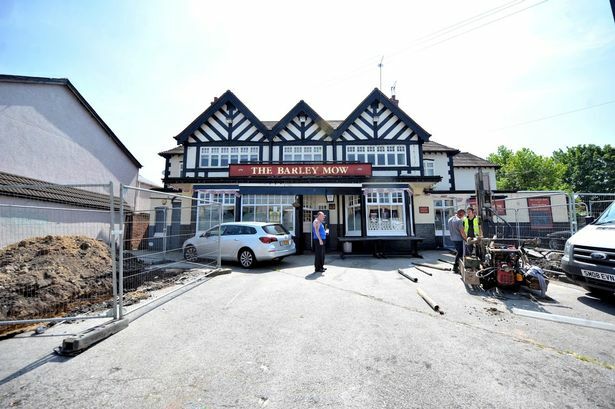 In Birmingham, England, archaeologists are working outside of The Barley Mow pub. The pub owner believes they will find the remains of one of Richard III’s knights. However, a spokesman for the construction company behind the dig is less sure. “The archaeological investigation has found several 17th century post-medieval rubbish pits," he said.“There is no truth in the suggestion the team were looking for the remains of a follower of Richard III and nothing was found relating to the late medieval period.” You can read more from the Birmingham Mail. A more promising find has occurred in Heslington, just outside of York. A Roman well, dating from the late fourth to early fifth centuries, has been uncovered, along with more than a 1000 pieces of Romano-British pottery, including two almost complete Huntcliff-type jars, and a similar number of animal bone fragments. Steve Roskams, Senior Lecturer at the University of York said, “It is striking that all of the material found in our well would have been familiar to those inhabiting this landscape. Its construction incorporates a finial which, we argue, probably came from the dismantling of a nearby, good-quality structure. The jars circulated here widely, the Huntcliff-type probably being connected directly to water usage. The other pottery and the animal bones also comprise well-understood 'mundane' elements that were available locally." Finally, what is new on Youtube for medievalists? There is this video, entitled '5 Of The Most Gruesome Medieval Torture Devices' - please keep in mind that only one of the five torture devices mentioned here - the Rack - was actually used in the Middle Ages. Most of the others are first mentioned in the Early Modern period. Two recent archaeological stories are getting some media attention. First, in southern Poland a graveyard was discovered that contained four skeletons that had their heads buried between their legs. Radio Poland explains that "according to folk beliefs, this prevented a possible vampire from finding his or her way back to the land of the living. There was no trace at the burial ground of any earthly possessions, such as jewellery, belts or buckles." The graves were discovered during the construction of a roadway near the Polish town of Gliwice. Tests will be carried out to determine when the skeletons were buried, but the archaeologists believe they date back to the early modern period. You can read the full article from Radio Poland. 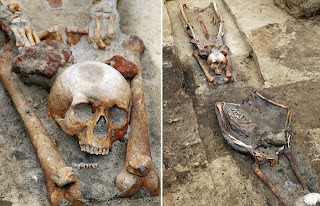 Other discoveries of 'vampires' buried in graveyards include a woman found in Venice whose skull had been impaled through the mouth with a brick, over 100 skeletons found in Bulgaria that have had an iron rod piercing their chest, and in Ireland they have wedged large stones into the of mouths of skeletons to prevent them from rising from the dead. 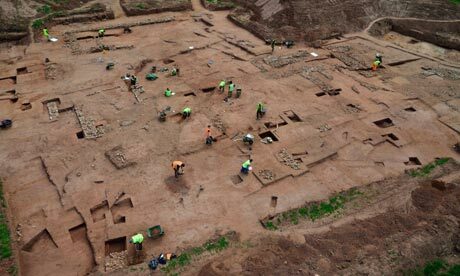 Meanwhile, archaeologists working in Somerset, England, were surprised to discover a large site of medieval buildings. No records of this site exist, but the archaeologists believe it might have been connected with nearby Glastonbury Abbey. Roof slates, glazed ceramic roof tiles and decorated floor tiles suggest that these were substantial buildings of high status. You can read more from Wessex Archaeology. American rap star JAY-Z has released a new album this month entitled Magna Carta Holy Grail. 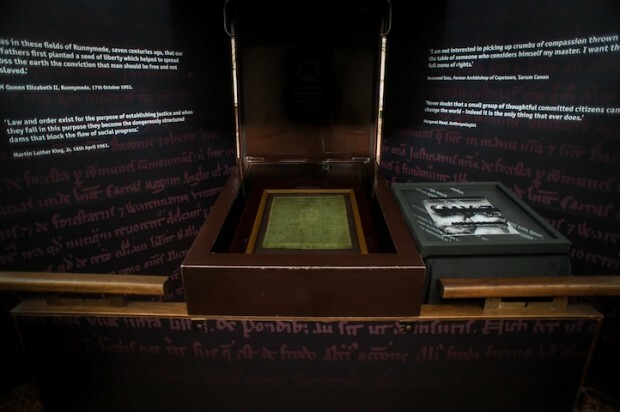 To promote the album, they have placed artwork of the album's cover next to one of the earliest copies of the Magna Carta in Salisbury Cathedral. Dean of Salisbury the Very Reverend June Osborne told the Salisbury Journal, “We are delighted that Jay Z has chosen Salisbury Cathedral, home to the finest of the four surviving Magna Carta, as the location for the global premiere of his artwork. We know how important the Magna Carta, and all it represents, is to people across the globe. The ideals it embodies are still relevant today. Jay-Z was impressed with the ideals of justice and responsibility as written in the Magna Carta, and one song even includes the line "To no one will We Sell, to no one will We deny or delay, right or justice."